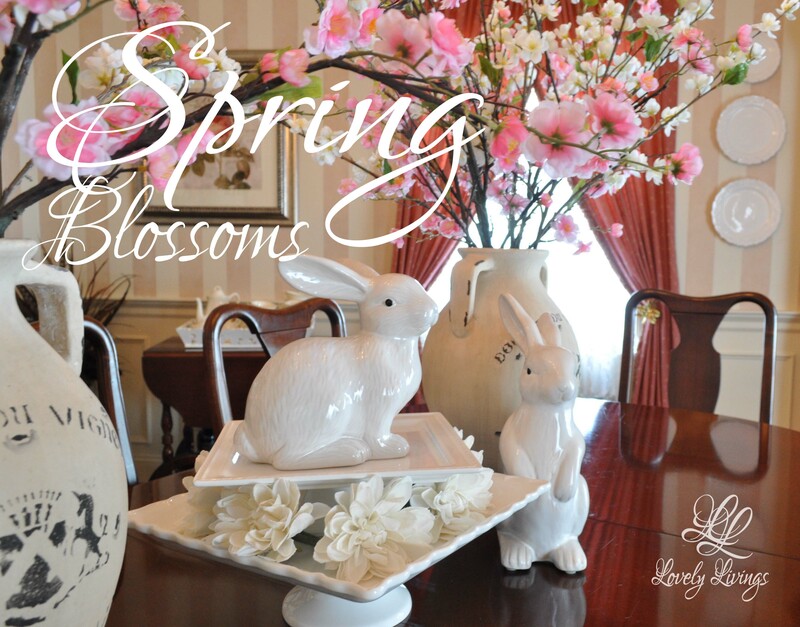 Spring blossoms have bloomed on my table in the dining room. It’s not quite ready for Easter Sunday, but I do have the center of the table ready for the day. I wanted to make a prominent impact this year on the table and I think I’ve achieved it with these faux pink and white Cherry Blossom branches. Their pretty branches spread out beautifully along the length of the table and they are just the right height for the table design. 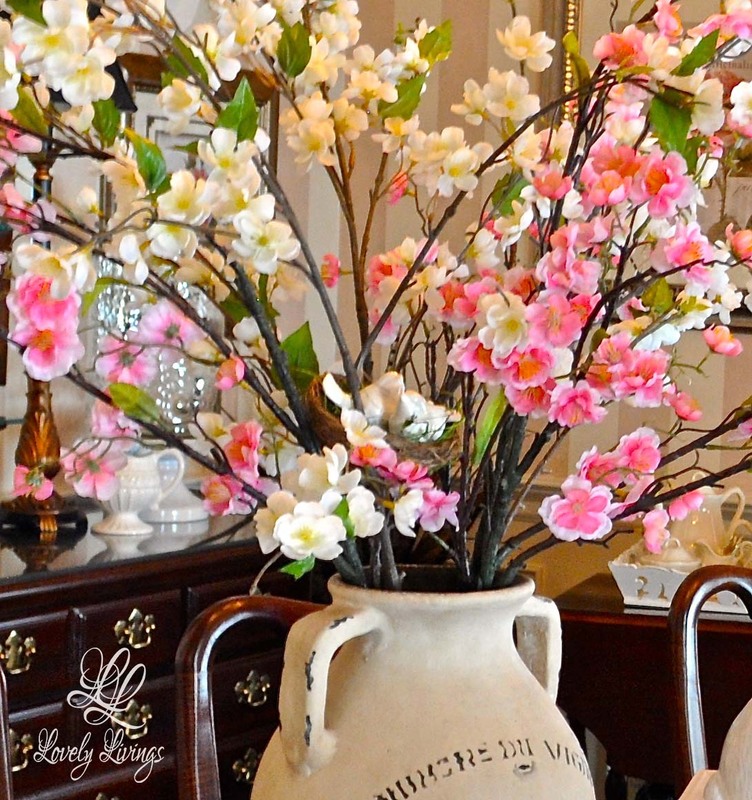 Two vineyard distressed vases hold the multiple Cherry Blossom branches perfectly in place. Their size and shape (9″ Diameter x 14.5″H ) work nicely in the design I created. The vineyard charm of these rustic earthenware vases adds to the table’s prominence and provides a casual touch to the display. These cute ceramic bunnies look as if they are patiently waiting under the Cherry Blossoms. I layered two square cake stands to create height for the shorter bunny. This way it looks proportionate to the taller bunny and gives the vignette interest. 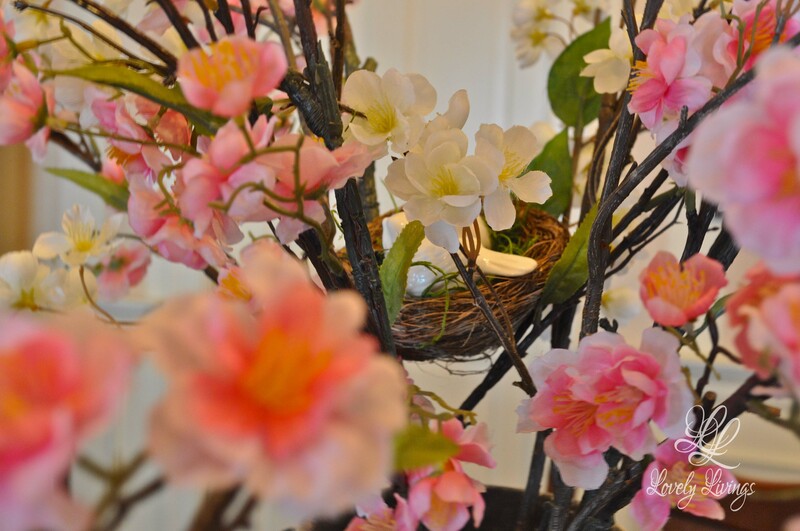 I tucked a small bird’s nest into each of the Cherry Blossom arrangements. Then, I placed two little white ceramic birds into each nest, as if the birds flew in and made these nests their homes. 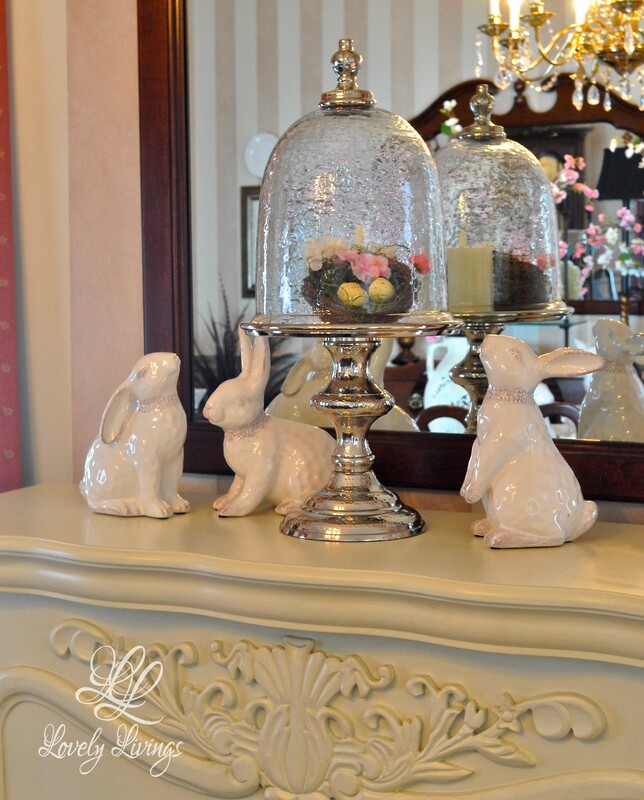 Other bunnies frolic on top of the fireplace mantel in the room. They surround a glass cloche stand that houses another bird’s nest. 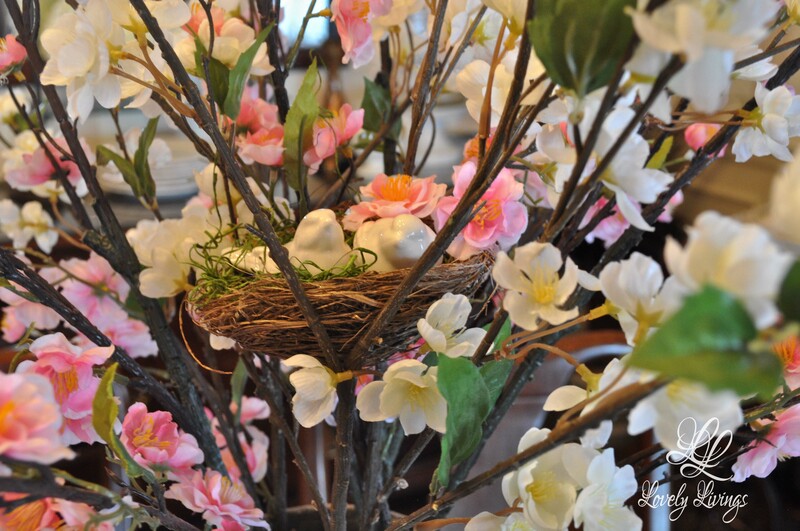 It’s decorated with a few pink and white Cherry Blossom flowers and small yellow colored eggs. I hope you enjoyed my “Spring Blossoms” post! Feel free to pin my Spring ideas onto your Pinterest boards. Thank you Katherine! You are too kind! I really do appreciate your lovely comments. Thanks for hosting your wonderful parties. I wish you and your family a lovely Easter! Beautiful! I love your vases and cherry blossoms, they give the whole table an elegant look with your bunnies. Your cloches are wonderful too! You inspire me! Have a great Easter! Thank you Elaine for your lovely comments and for visiting! I’m happy that my post inspired you. I love it just darling. Thank you Kelly for your lovely comment and for stopping by! 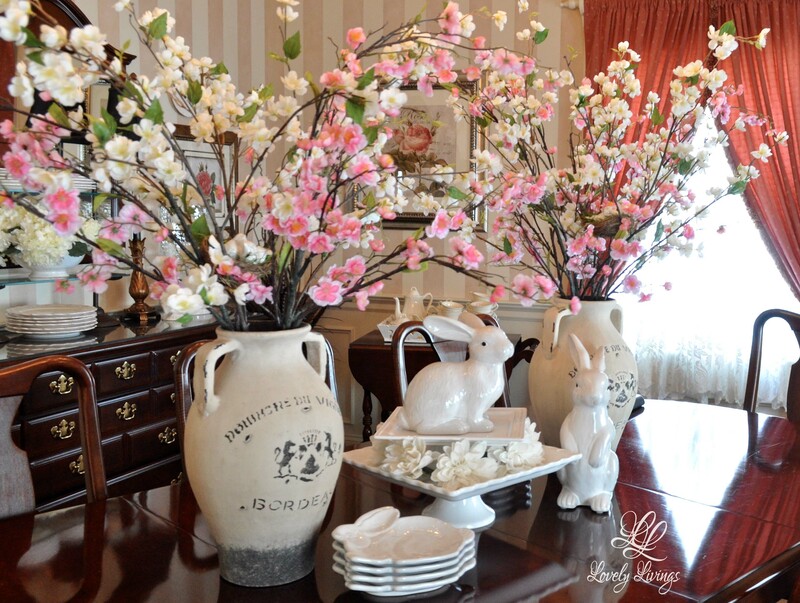 Oh those cherry blossoms and their vases are perfect for spring! Thanks for the lovely comment and for the visit! Your Spring Blossoms are gorgeous! 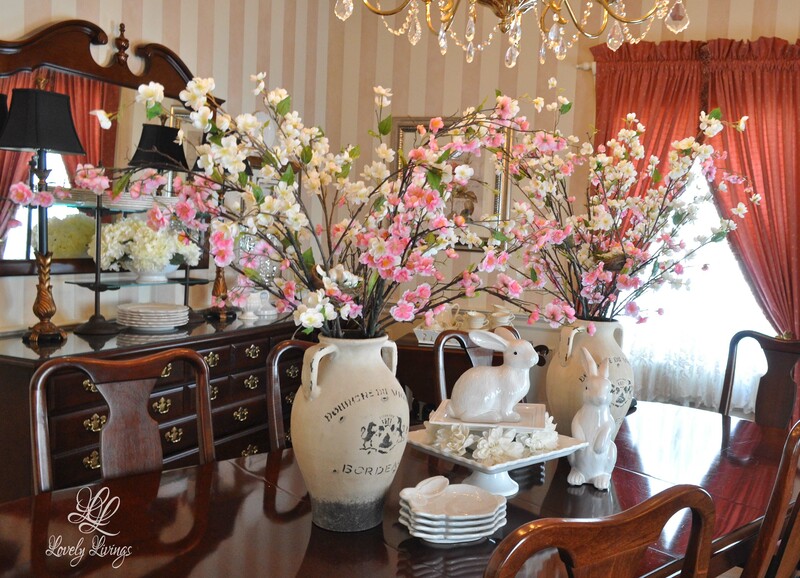 I love what you have done in your dining room – it looks so perfect for Easter. Thank you for sharing this lovely decor with us at the Hearth and Soul Hop. Pinned and will tweet – Happy Easter! I love the way you tucked the bird nests into your arrangement. You table is beautiful! It was great to see you at the Thursday Favorite Things Blog Hop! 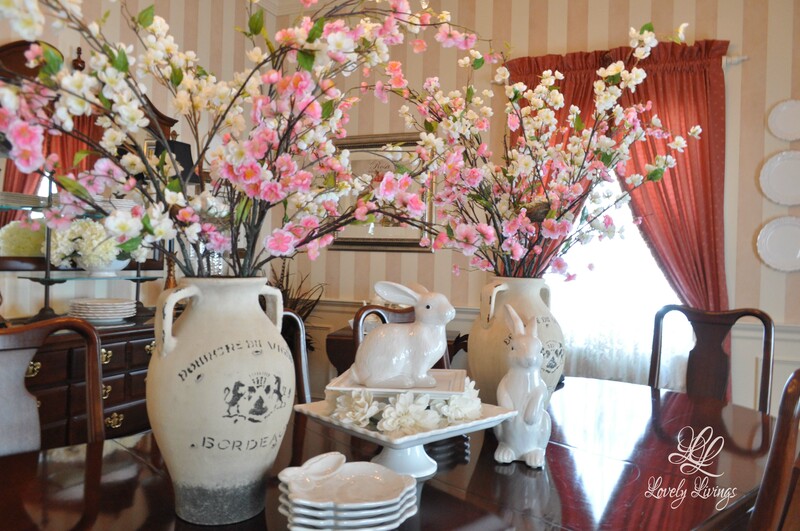 Your cherry blossoms and Easter décor is incredibly lovely! I especially like the sweet birds nest chloche! Thank you for sharing at Oh My Heartsie Girls WW! Looking forward to seeing you next week! Have a beautiful Easter weekend! LuAnn, love the faux blossoms! I picked crabapple blossoms from my tree yesterday and filled three old aqua ball jars for my table. Spring blossoms are just gorgeous! Thanks for sharing with SYC. You always have the prettiest tablescapes. Thank you so much fora sharing on Found & Foraged! I love the spring blossoms, so enjoying this spring. The bird nest is such a cute touch nestled in the branches. Dont forget to share on Oh My Heartsie Girls WW this week!